The ideal choice for a wide variety of applications where low-noise, ease of maintenance, hygiene, and dust-control are essential. Trantec specialises in the design and manufacture of Flexible Screw Conveyors, providing conveying solutions to process manufacturers and machinery suppliers for over two decades. Well known for their simplistic design, Flexible Screw Conveyors, A.K.A. Flexi Screws, will in most cases consist of one moving part, the spiral auger. The spiral (also known as a flex auger or flexible screw) self-centres itself inside of the hollow outer tube using the conveyed material to do so. These are also knows as Flexible Spiral conveyors. Over the years, the Flexible Screw Conveyor has been given many different names and incarnations since its inception in 1958 by Marion H Fennimore and Ivan J Stephenson who first used the term to describe their creation (although only semi-flexible in design). Whilst the name given can often be subject to location, many manufacturers have been known to brand their equipment. Simple, reliable, and all-around versatile, Flexible Screw Conveyors are a common choice for transportation of powders and dry bulk solids. Consisting of one moving part, the flexible spiral, process engineers around the globe opt for their low-maintenance requirements and overall reliability. Flexible Screw Conveyors are designed to be exactly what their name suggests… flexible! Trantec offers a wide range of configurations and directions including vertical, horizontal, at an angle, around fixed equipment, through to another room, with multiple discharge points, fit in a tight spot, or a fully mobile unit. The spiral auger is designed to self-centralise inside of the ultra-high molecular weight polyethylene (UHMWPE) conveying tube, which maintains dust-tights conditions, preventing cross-contamination. The spiral uses the material being handled to keep itself rigid, which is maintained through consistent mixing of the contained powders. A single motor drives the spiral, gently transporting powders without the risk of product degradation, before dropping out of the material outlet at constant pre-determined rate. Trantec Flexible Screw Conveyors offer efficient, low-cost transport of powders and dry bulk solids. Suitable materials include fine powders, granules, large pellets, flakes, and pills. We have considerable knowledge and experience in the solids handling industry, working alongside some of the best-known brands and OEMs spanning over twenty years. Trantec’s Flexible Screw Conveyors are constructed in mild steel, 304, or 316 stainless steel with a variety of polish finishes to choose from. These include welds as laid, standard, crevice-free, and mirror (0.2Ra). These materials include construction of any inlets, outlets, hopper, lids, agitators, connection flanges, and drive shafts. Mild steel (or low-carbon steel): A composition of iron, carbon, and manganese, it is a low-cost construction material. Known for its ease in shaping, making manufacturing this steel alloy cost-effective and easy to manipulate. Not suitable for food contact or pharmaceutical processes. 304 stainless steel: An alloy composition containing 18% chromium and 8% nickel, 304 stainless steel is the most common construction material around the world due to its resistance to acidic and caustic solutions, combined with reduced risk of intergranular corrosion and high ease of fabrication. 316 stainless steel: Greater resistance than 304 stainless steel. Easier fabrication, welding, and cleaning properties. Increased resistance to sodium chloride (NaCl) based substances. Typically used for the construction of food and pharmaceutical solutions. Easy-clean features are provided, including quick-release, for added assistance in reducing downtime. Trantec works closely with all USDA, EC, FDA, and 3-A diary food contact legislation and can advise the most suitable construction and finish as required by current legislation. UHMWPE is an approved material of extrusion and is the number one choice for conveying tubes for to its excellent low friction, chemical resistance, and overall high wear resistance properties. Many of our components are now produced in-house from specifically selected materials of our choosing. Trantec can advise on the pros and cons of all, with full traceability available upon request. 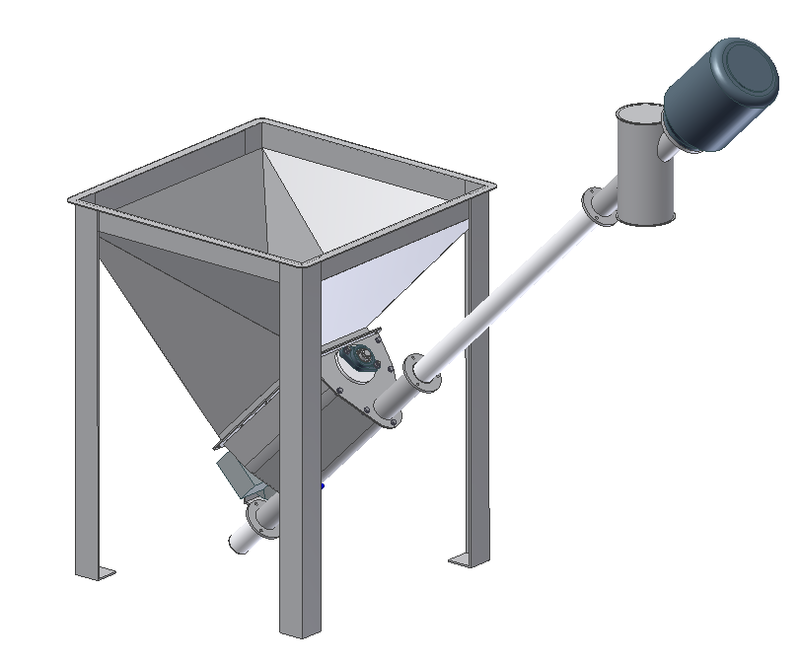 A storage hopper, sack tip station, or FIBC Discharger. Alternatively, will be fed directly from other materials handling equipment. Inlet (where materials are deposited to) and corresponding connection flanges. 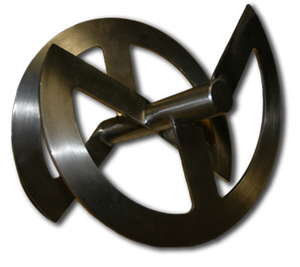 Spiral auger – cut to length, spiral section profile dependant on material properties and requirements. UHMWPE outer tube – dust-tight, cut to length, and size to match spiral auger. Outlet (where materials are dispensed from) and connection flanges. 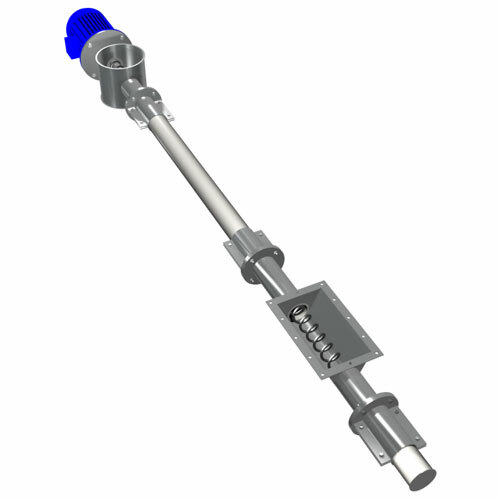 Drive shaft with motor adapter. Three phase electric motor, 50/60hz – typically AC or DC (AC for higher RPMs). 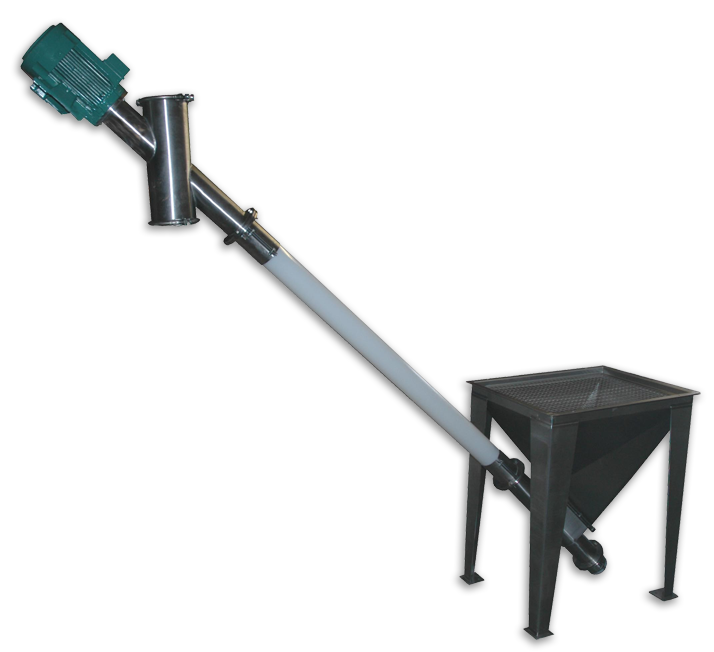 The above is an example of a base model powder conveyor and will not include any additional features such as agitation or quick-release. An agitation device may be required for poor-flowing materials. 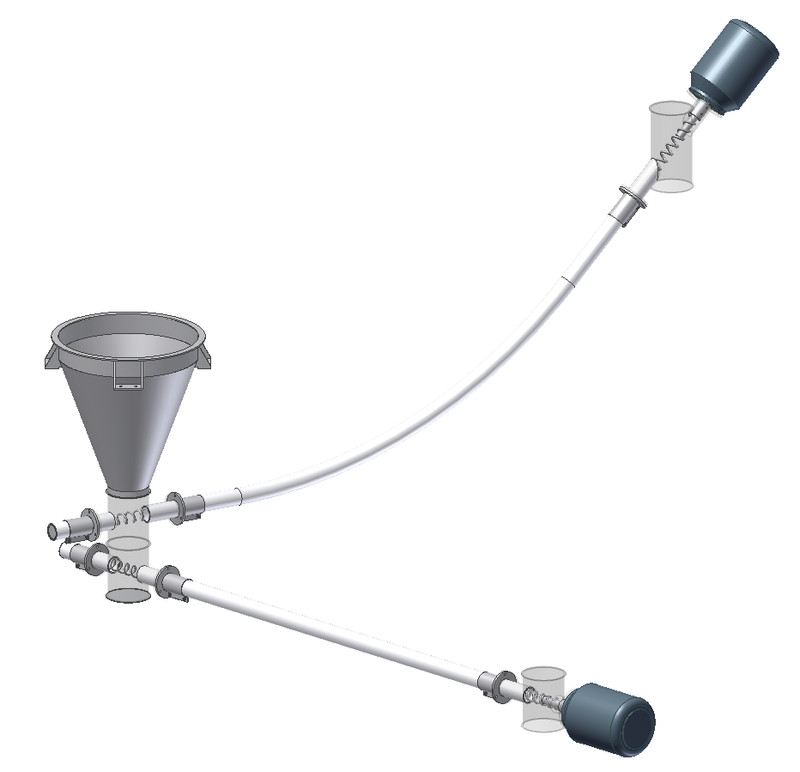 To prevent material build-up, an agitator will be added to constantly condition and break apart the powder. A blade mechanism is the typical method, with the type of agitation specifically selected for the application and to suit the material flow properties. Vibratory agitation is occasionally used for certain powders and granular materials that cannot flow with traditional techniques, but is far less common. Trantec’s agitation devices are independently driven, providing precise control of speed of rotation and levels of product conditioning. Below are examples of common issues faced with poor-flowing materials. Bridging (or arching): When powders form a bridge or arch above the spiral or discharge point in the hopper, causing similar issues to rat-holing.pers inlet, preventing material from dropping and entering the inlet for conveying. The full term given to this is Bridging and Rat-Holing. Both of these will have an affect on your product flow rates, so it is important that your equipment is able to handle the application. After all, you can’t design your powders flow properties to suit your machine! 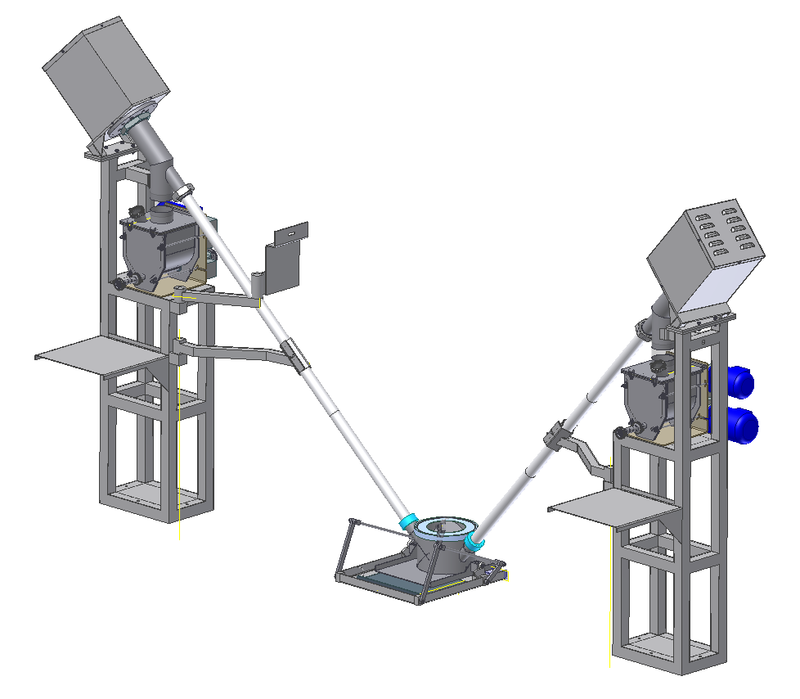 Trantec’s Flexible Screw Conveyors or Flexible screw augers are available in a selection of designs and configurations, whilst staying true to their key operating principles. We offer tailored solutions based solely around your application, ensuring the most efficient means of transport whilst producing accurate throughout rates as desired. Whether horizontal, vertical or at a 45° angle, through to a different room in your process plant, or with multiple discharge points, Flexible Screw Conveyors can be adapted to suit almost any application without compromise. Our flexible UHMWPE tubing and spiral augers allow for construction around bends and obstacles, meaning our Flexi Screws can be fit into the tightest of spots – hence the name Flexible! 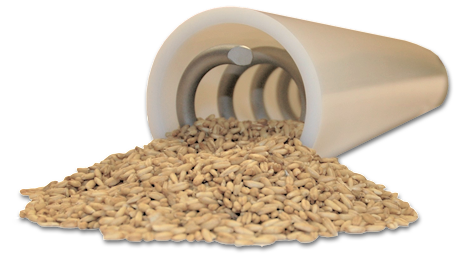 Flexible Screw Conveyors are carefully engineered and can be configured for both batching and continuous conveying, giving them further popularity in the solids handling industry for their versatility. Common materials conveyed include powders, pellets, crystals, friable materials, granules, and flakes, just to name a few. Trantec has the manufacturing, innovative technology that has enabled many UK and EU-based OEMs to incoporate our products into their industries. Some of the products that are used are Flexible Screw Conveyors, Metering Screw Feeders and dumping discharge stations. Sometimes larger custom-built machinery is added – such as Rigid Auger conveyors and dosing systems.